SayWhatNews: Hello Alia, Lalisha and Akissa a.k.a Allure. Thanks for speaking with SayWhatNews. Tell us who is Allure. Allure: Thanks so much for having us. Allure's made up of 3 childhood friends, who love to sing and spread our joy and love through music. SayWhatNews: How did you choose the name Allure and does it have a meaning? Allure: That name was actually given to us by one of the producers we were working with at the time, he felt the meaning of Allure described us as a group as well as our sound. Allure means the power to entice or attract, so we loved it and said YES THAT IS IT!!!! 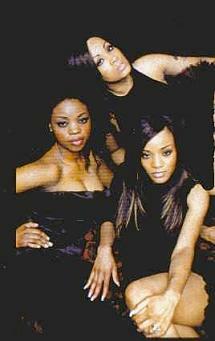 SayWhatNews: Allure hit the music scene back in the 90’s and had 4 members: Alia, Lalisha, Akissa and Linnie. What happened to Linnie? Is she no longer in the group? Allure: At the time the group was being pulled in several directions. She chose to pursue other endeavors. The three of us decided that we worked to hard to just let it go. SayWhatNews: Well, us Allure fans are glad to hear that, we missed you ladies. Now. the 3 of you all attended the same Performing Arts High school in New York. Tell us how you were discovered? Allure: Yes we did. We use to rehearse after school at a community center in the Bronx and a mutual friend of ours knew one of the producers from the Trackmasters. He loved us and we started recording our first album. SayWhatNews: Its all about timing sometimes. So, Allure was first signed to Mariah Carey’s record company Crave Records. You must have felt like, boy we have made it. How was it being a part of Mariah Carey’s record company? Allure: Well a lot of people do not know we were actually first signed to LaFace records (Babyface and LA Reid’s record label). We were at a stand still for a while, when Mariah heard one of the songs we recorded called The Story, she loved it and wanted to sign us right then so we were blessed with another great opportunity. SayWhatNews: No, I did not know that about LaFace Records. Oh well, they missed out. Allure’s debut single “Head Over Heels” ft. Nas went Gold and the your remake version of Lisa Lisa and Cult Jams’ ft Full Force “All Cried Out” which ft multi-platinum group 112 went platinum. How surreal was that having two of your songs go Gold and Platinum? Allure: We were actually in shock because we were doing a promotional tour in Japan and when we came home we were hit with the great news. People knew who we were and we were like wow this cannot be happening. SayWhatNews: One of my favorite songs off your first self titled album “Allure” was “No Question” ft LL Cool J. What was it like working with great talents such as LL, 112 and Nas? Allure: It was a blessing that on our debut, all these stars were willing and wanted to work with us. We were excited because at the same time we were fans of those people and here we are working with them. SayWhatNews: Now Allure, you followed that album with your second album “Sunny Days” and your third album “Chapter III”. What happened? The group seemed to just disappear with no word. Allure: Well by that time all the turmoil was happening, we were on the road and came back to find our label Crave was gone without so much as a phone call and then we were given to Columbia Records. From there we got lost in the sea of girl groups that were already there, so we had to leave. We then signed to MCA and recorded our second album “Sunny Days” which started off great with our first single “Enjoy Yourself”, which could have been a hit because people loved it, they just didn't know that Allure was singing it because of lack of promotion.So once again we found ourselves without a label. We as a group had to get ourselves together, after awhile all these things do start to take there toll on you and our fourth member decided then to go her own way. So the three of us regrouped and decided we were not going to let these obstacles stop us from doing what we loved. Then we met Ron Artest and he was starting a label and we thought this would be a great way to do our music independently. We must say he did try his best but he had his own personal as well as professional troubles he had to deal with and it just did not work out and Chapter III was never heard. SayWhatNews: You know road blocks can either make you stronger or break you and we are happy that Allure’s road blocks made you ladies stronger and better. On Youtube, people are still watching your videos. One of the most recent comments from just 3 days ago was “What happened to them, does anybody know?” So what have you ladies been up to since your last album? Allure: Oh believe us, we go on Youtube to see what is going on and we appreciate the love from those that want to know what is going on, as well as the negative that keeps us strong. We have always been blessed to still be able to travel and still do shows because people still want to hear us and “All Cried Out” was a very big song for us and we thank everyone. SayWhatNews: February 16th and 26th Allure has two albums being released. Tell us about the new music. Alllure: Well these are not actually albums, just a few songs we recorded to let our fans know we have not forgotten about them. We get so many people on our Facebook and Myspace pages asking us for songs and when are we coming back. So, we just wanted to give them something to let them know we are still singing, but we are still working on our album. SayWhatNews: You ladies (Allure) have decided to start your own label and have more control of your music and the decision making. What have you learned over the years that is going to help you run your own music label? Allure: No one knows us better than we do and sometimes labels want to tell you who you are, and for a long time we let that happened because all we wanted to do was sing. We were young and did not realize how important it was to be involved in everything, we allowed the "heavy hitters" to tell us who we were going to be. Now we are women who have been through a whole hell of a lot and we have a lot to sing about and a story to tell and that is what our new album will represent. SayWhatNews: Good lessons learned. We hope your new album and record label has great success. Are there any collaborations on the new album? Allure: Not as of yet but you never know. SayWhatNews: Tell us about the most memorable moment/ or experience with a fan? Allure: There are so many but one has to be when we were in Florida to do the national anthem for a football game and our driver for the day a let us know his daughter was a fan of ours and she passed a way, so we sang a gospel song for him right at that moment and he cried and we cried. It felt good to know we could touch someone even if only for a moment. That is one of those rare moments when we as a group sometimes feel like we cannot do this anymore, we think about that experience and say this is why we keep on singing to touch people. SayWhatNews: Wow, that is a memorable moment, so touching. So many of the groups/singers are coming back/ touring and singing their hits. Why do you believe there is such a high demand for music from the 80’s and 90’s? Allure: People we think want to bring singing back. They want to hear real music again, not to take a way from today but when was the last time you were at a club and was asked to dance to a heartfelt ballad? Even the fast songs had meaning ,you would listen to the words and you could relate. SayWhatNews: That is so true, some of the new music today has no heart felt/pull at the heart strings meaning. Is there anything in your career you would change and why? Allure: Actually when we think back everything including all the crap and disappointment, If it was not for those things we would not be the women we are today. We know people always say that but it is true and even with those negatives we are still standing in our stilettos strong with our heads held high. SayWhatNews: What advice would you give an aspiring singer/group? Allure: KNOW WHO YOU ARE!!!!!!! And know your business and make sure your team is strong and tight. SayWhatNews: What’s next for Allure? Allure: Well for right now we are concentrating on our music and whatever great opportunities come after that we are open for them all.